American director Edwin S. Porter, chief of production at the Edison studio, helped to shift film production toward narrative story telling, with this quintessential western tale. It is often credited as the first modern narrative motion picture. It was the most popular and commercially successful film of the pre-nickelodeon era, and established the notion that film could be a commercially-viable medium. One of the most influential westerns ever made, and one of the first westerns (remarkably, it was filmed on the East Coast in New Jersey - not in Hollywood). With innovative and modern film techniques, such as on-location shooting, multiple camera positions (less stage-bound camera placement), filming out of sequence and later editing the scenes into their proper order, and parallel inter-cutting or cross-cutting between simultaneous events (to express simultaneous action). In the film's fourteen scenes (or fourteen individual shots), the narrative story with multiple plot lines was told - with stereotypical elements that were copied repeatedly afterwards by future westerns. It was also memorable for its audience-shocking, signature final scene (placed at the beginning or end) of a cowboy (Broncho Billy Anderson) shooting his pistol. The remarkable film was greeted with the same kind of fanfare that Sam Peckinpah's violent The Wild Bunch (1969) received many years later. Winsor McCay's third animated film was the first "interactive" animated cartoon, and was the earliest example of combined 'live action' (at the beginning and end) and animation. 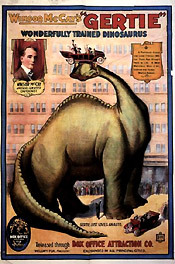 In the live action segment, McCay took a ride on dinosaur Gertie's back. It would be a long time before Who Framed Roger Rabbit (1988) duplicated the effect. The title character was the first major North American animated character - Gertie the Dinosaur. The animation required 10,000 drawings, all drawn from scratch (the single-frame method). Single images projected at a high volume of frames per second created the 'animated' effect. It was not, as some have claimed the first animated cartoon. That honor belonged to Humorous Phases of Funny Faces (1906). d. Henry Lehrman, 11 minutes (short), Keystone Film Co.
Silent actor Charlie Chaplin was Mack Sennett's (and Keystone Studios) most important discovery. In 1914 alone, silent comedian Chaplin made dozens of films and became filmdom's first great star. The mostly physical comedy and low-brow humor in Chaplin's repertoire was marked by many pratfalls and clever sight gags. Chaplin debuted his trademark small-mustached, derby-hatted, baggy-pants, bamboo-caned 'Little Tramp' character with oversized shoes in this short, his second picture. The Tramp's costume was debuted in the film. It was the Tramp character's first public appearance. The Tramp character was a popular anti-hero figure who struggled (with ingenuity and resourcefulness) to survive against many insurmountable forces. The gallant Everyman character portrayed by Chaplin would become Keystone Studios' most popular. It also became Chaplin's most famous, enduring and legendary character, until it was retired at the conclusion of Chaplin's Modern Times (1936). It was filmed at a home-made "pushmobiles" race for boys in Venice, California. A controversial, explicitly racist, but landmark American film masterpiece - the most important picture of the silent era. One of the most successful early epic films made in the US, often cited as the greatest silent film of all time. Griffith was keeping pace with other silent era epics from Italian filmmakers, including The Last Days of Pompeii (1913, It.) (aka Gli Ultimi Giorni di Pompei) and Cabiria (1914, It.). At almost three hours in length (a lengthy story narrative), it was the longest film to date. It also had tremendous budget, at $112,000. It also featured a full, three-hour musical score of original music, contemporary standards such as “Dixie,” and classical music such as Richard Wagner's Ride of the Valkyries. Its release set up a major censorship battle over its vicious, extremist depiction of African-Americans, although Griffith naively claimed that he wasn't racist at the time. Formed only six years earlier, the NAACP challenged the film's depiction of the KKK, and riots broke out in a number of Northern cities, and in other places the film was banned outright. 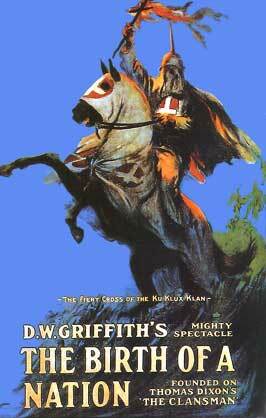 Unbelievably, the film is still used today as a recruitment piece for Klan membership. Its racist overtones have engendered controversy that hasn't let up to the present day. It proved the overriding premise that controversy helps to fuel a film's box-office appeal. President Woodrow Wilson was given a private screening of the film at the White House - a precedent - it was the first film to be shown in the White House. It is the single most important and key film of all time in American movie history - containing many new cinematic innovations and refinements, technical effects and artistic advancements (these many techniques are now standard features of films, but first used in this film), including a color sequence at the end. Many of the actors and others involved in the shoot, including Lillian Gish, Mae Marsh, Donald Crisp, and Wallace Reid went on to have long, lucrative, influential film careers. It has been little acknowledged that many future directors appeared in the film: John Ford (as an uncredited Klansman), Raoul Walsh (as assassin John Wilkes Booth), and Jules White and David Butler (as Northern/Confederate soldier extras). It had a formative influence on future films and has had a recognized impact on film history and the development of film as art. In fact, it set a negative tone for future war films that emphasized racial hatred, conservative US isolationism, and exclusionary nationalism up until the early 1930s. This anti-war drama from Irish director Rex Ingram was adapted from Vicente Blasco Ibáñez's 1916 best-selling novel about the Great War. It proved to be Metro Pictures' most expensive big budget film, with a production budget of almost $800,000. This was the first starring-lead role for Rudolph Valentino (an Italian immigrant), who became a super-star and was known as "The Latin Lover" (eventually overshadowed by his role as the Sheik) as a result of the film, for his role as Argentinian soldier Julio Desnoyers, fighting for France in WWI. Some have called it the first "modern" film, for its extravagant production design, its flowing epic narrative, and impressive special effects (and filming of battle sequences). 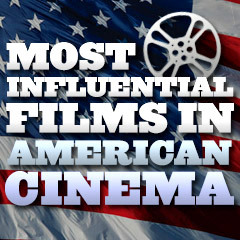 Adjusted for inflation, this war drama was the top-grossing film of its year, and the highest-grossing silent film ever. It eventually earned $9.2 million (domestic) - about $381.1 million in adjusted dollars. It was one of the first films to make $1 million at the box office. The successful production made it financially possible for MGM Studios to be formed. The forbidden tango dance scene (embellished and not in the original novel!) between Rudolph Valentino and his dance partner (Beatrice Dominguez) in a dingy, smoke-filled Buenos Aires Argentinian cantina (in the rough Boca district) created a tango dance craze, and it was afterwards fashionable to wear gaucho pants. As a footnote to the film, it inspired a young Betty Davis to try acting. Screenwriter, casting director, and film editor June Mathis became Metro Pictures' sole female executive, and one of the first in film history, when she was selected to produce this film. She was the one responsible for giving Valentino his greatest film break and causing him to become a new screen idol. As a result of The Four Horsemen of the Apocalypse, Mathis became one of the most powerful, well-paid and respected women in Hollywood. A forerunner of the modern documentary, generally regarded as the first feature-length film documentary or non-fictional narrative feature film. 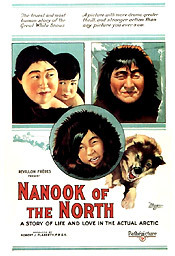 A record of life among the Inuit Eskimos in the Arctic. Flaherty's film helped to usher in the documentary film movement, although it raised some controversy because it 're-created' or staged some of its hunting scenes, rather than being truly non-fictional. 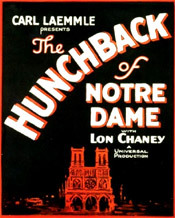 Based on Victor Hugo's 1831 novel about a deformed, Parisian Notre Dame bell ringer named Quasimodo. The silent film was produced by Universal Pictures studio head Carl Laemmle, at the urging of producer Irving Thalberg, who went on to a long career at MGM Studios. This was a star-making role for character actor Lon Chaney, who soon after began his reign as the "Man of a Thousand Faces," (probably the greatest actor of the silent era) because of his remarkable use of make-up (with a 20 pound hump, a wig, puffy cheeks, false teeth, fake eye, etc.) to transform himself into the grotesque lead character with a mis-shapen, gargoyle face and one eye. Even so, he was able to establish a strong, emotionally-sympathetic connection with audiences. There have been many versions of Hugo's novel - this lavish period drama was the only one to rival the quintessential 1939 version with Charles Laughton. This Universal production was reportedly the studio's biggest money maker of the silent era, and its costliest at over $1 million. It was a remarkably massive film production, with its 19-acre set (on the Universal City studio backlot) including huge Gothic structures (especially the giant cathedral), elaborate special effects, 750 crew members, and thousands of extras. The fearless Chaney helped to set a high standard for future horror films and other historical epics, as well as illustrating how he was a master of disguise. He fully and convincingly inhabited various roles of tortured and outcast villains and victims in almost all of his films. One of his most impressive and amazing silent films a few years later was Tod Browning's horror drama The Unknown (1927) in which Chaney (in his fourth of ten films with Browning) masqueraded as an armless man in a gypsy circus to evade police. There were no existing original 35mm prints of the film and no camera negative, so all of the prints available today were derived from the 16mm master version printed in 1926 - the closest to the original release known to archivists. 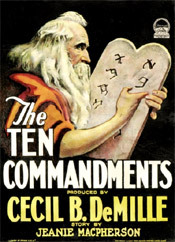 This was director Cecil B. DeMille's first version (silent) of the Biblical epic The Ten Commandments, remade in 1956 as a four-hour, entirely Biblical, VistaVision blockbuster with Charlton Heston as the definitive Moses. Some of the biggest successes of the 1920s were similar to the wide-screen epics of the 50s, such as this big-budget, $1.2 million epic. It was DeMille's first Biblical pageant and his first financially successful epic, although his extravagant spending worried the studio at first. It became the most popular movie attraction of 1924 and 1925. Unlike the 1956 film, this one was divided into two distinct parts: the biblical Exodus (the first third), and a present day 'modern' story (in 1923 San Francisco) that delivered moral lessons about the consequences of breaking the commandments for members of the McTavish Family and two females, Mary Leigh (Leatrice Joy) and Eurasian adventuress Sally Lung (Nita Naldi). 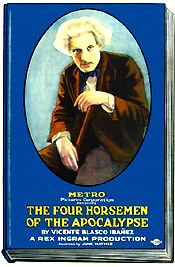 Always noted as a showman, Cecil B. DeMille's name was forever associated with extravagant production values and biblical spectacles (with rich doses of orgies and bathing scenes) that he first filmed in the 1920s, including this film and others that followed, such as The King of Kings (1927), The Sign of the Cross (1932) (these two films formed a trilogy with The Ten Commandments), Cleopatra (1934), The Crusades (1935), and Samson and Delilah (1949). It was the most expensive film ever made, and had six cinematographers. The scenes of the Exodus involved at least 3,000 animals and 3,500 extras. It featured the largest set ever constructed in movie history to that time - the 'City of the Pharoahs' (gates 120 feet tall and 720 feet wide, and with four massive 35 foot tall Egyptian statues weighing 1,000,000 pounds). After the big-budget film was made, the director ordered the set in San Luis Obispo County (California) bulldozed and buried -- 60 years later, archeologists uncovered part of the set at the location known as the Guadalupe-Nipomo Sand Dunes. This early Cecil B. DeMille epic used primitive special effects techniques (a wall of fire and other pyrotechnics), and some segments were filmed in early two-strip Technicolor (such as the "Exodus" segment, and the famed Red Sea sequence). The 'parting' of the Red Sea was accomplished by filming water as it poured down two sides of a U-shaped tank, and then running the film backwards - to make the water appear to divide. The illusion of keeping the walls of water separated was accomplished by slicing a slab of jello in two and filming it in closeup - and then combining (or double-exposing) it with live-action footage of the Israelites walking into the distance and the Egyptian chariots in pursuit. Raoul Walsh's timeless and expensive silent costume fantasy was a lavish and bold Arabian Nights swashbuckler-adventure film - and a spectacular accomplishment in production design and state-of-the-art special effects from production/art director William Cameron Menzies. It brought film audiences to a new level of imagination and fantasy. The visually-opulent film was inspired by writer/director Fritz Lang's Der Müde Tod (1921) (aka Destiny or The Tired Death) - the source for the flying horse and carpet sequences, and adapted from One Thousand and One Nights (or Arabian Nights). It was one of the greatest Hollywood studio silent films ever made, and the most expensive at its time, costing over $1 million to produce (and budgeted at about $2 million). It was the first of four versions of the classic Arabian nights tale - influencing the other films made in 1940, 1961 (It./Fr. ), and 1978 (TV), and it also had a lasting influence on other fantasy tales. But it was a box-office failure and underappreciated. It showed off revolutionary visual effects and displayed legendary production design with its massive palace sets. The astounding and innovative visual effects in the fairy-tale included: a smoke-belching dragon and underwater spider, a golden apple of the sun, an all-seeing eye, a cloak of invisibility, a flying horse, the famed flying carpet, and magic armies arising from the dust. 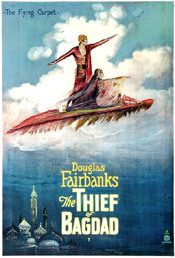 The storybook film featured amazingly difficult, acrobatic stunt work performed by 40 year-old Douglas Fairbanks (as he also did two years earlier in Robin Hood (1922)), the first major Hollywood celebrity. He performed with charisma and grace throughout the entire film, during a ride high above the city on a magic carpet, a battle with a fire-breathing dragon in caverns of flame, and a ride on the back of a flying horse (or Pegasus). As Ahmed, the titular 'Thief of Bagdad,' he had to also battle the evil and treacherous Mongol Prince (So-Jin) upon his return to woo back the Princess and prove his love. An imaginative, inspired masterpiece of dead-pan, passively-unsmiling, sardonic "Great Stone-Face" Buster Keaton comedy. It is generally regarded as one of the greatest of all silent comedies (and Keaton's own favorite) - and undoubtedly the best train film ever made. The Civil War adventure-epic classic was made toward the end of the silent era. Filmed against a backdrop of magnificently photographed Civil War battle scenes, it also contained one of the great chase sequences in movie history. Keaton's greatest picture (arguably) received both poor reviews by critics (it was considered tedious and disappointing) and weak box-office results (about a half million dollars domestically, and approximately one million worldwide) when initially released in the late 20s, and it led to Keaton's loss of independence as a film-maker and a restrictive deal with MGM. It would take many decades for the film to be hailed as one of the best ever made. Filled with hilarious sight gags and perfectly timed stunt work, the chase comedy was written and directed by Buster Keaton and Clyde Bruckman, and filmed with a huge budget for its time ($750,000 supplied by Metro chief Joseph Schenck). It was memorable for its strong story-line of a single, brave, but foolish Southern Confederate train engineer doggedly in pursuit of his passionately-loved locomotive ("The General") AND the woman he loved. The two things devoted and foolish Southern Confederate engineer Johnny Gray (Buster Keaton) loved most in the world were his Southern belle sweetheart Annabelle Lee (Marion Mack) and his passionately-beloved locomotive named The General. His stoic, unflappable reactions to fateful calamities, his ingenious and resourceful uses of machines and various objects (water tanks, a large piece of timber, a cowcatcher, a rolling artillery cannon on wheels, and unattached railroad cars), and the unpredictable forces of Nature, provided much of the plot. The General displayed marvelous technical and structural perfection, playful comic inventiveness and realistic romance, and non-chalant graceful, fluid athleticism on the part of Keaton - the Great Stone Face. Realistic stunts (without stuntmen to double for Keaton), uncontrived, free-flowing set-pieces, non-stop motion, and a preoccupation with authenticity made parts of the film a visual history of the American Civil War, with each shot looking like a Matthew Brady photograph. The film concluded with a climactic battle at a river gorge, with the dramatic crash of the pursuit train into the Rock River in the film's most spectacular scene - and the most expensive shot of the entire silent era. 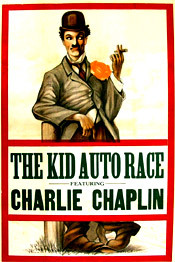 Most comics concurrent or following Keaton were influenced by his enduring and seminal work (deadpan comedy and precise physical comedy), including Charlie Chaplin, the Marx Brothers, the Three Stooges, Mel Brooks, Jackie Chan and many more. d. Alan Crosland, 88 minutes, Warner Bros. It should be made clear that this film was not the first sound film (although that's what most people believe), nor the first 'talkie' film or the first movie musical. It was not actually a synchronized sound film - it was originally shot as a silent film with the soundtrack added later. However, because of its timely significance, the musical melodrama ushered in the era of the talkies as the first film with audible dialogue. It was the first feature-length Hollywood "talkie" film in which spoken dialogue was used as part of the dramatic action. It was, however, only part-talkie (25%) with sound-synchronized, vocal musical numbers and accompaniment. There were only a few scenes, besides the musical songs, where vocal dialogue was spoken synchronously: (1) Al Jolson's words spoken to the camera: "Wait a minute, wait a minute. You ain't heard nothin' yet! ", and (2) Al Jolson's ad-libbed discussion with his mother while playing the piano. Warner Bros.' production head Darryl F. Zanuck was presented with a special Oscar at the very first Academy Awards ceremony in May of 1929, "for producing The Jazz Singer, the pioneer outstanding talking picture, which has revolutionized the industry." It was a huge success, responsible for transforming Warners into Hollywood's hottest film factory. The commercialization of sound-on-film, and the transformation of the industry from silent films to talkies became a reality with the success of this film. 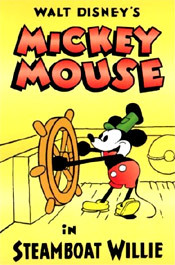 Mickey Mouse's first sound cartoon was Steamboat Willie (1928), appearing the same year as Buster Keaton's full-length feature comedy Steamboat Bill, Jr (1928). Steamboat Willie was released twice in the year (on July 29, 1928, in limited release and then re-released on November 18, 1928 with sound and premiering at the 79th Street Colony Theatre in New York). It was Disney's first cartoon with a post-produced synchronized soundtrack (of music, dialogue, and sound effects) and was considered Mickey Mouse's (and Minnie's) screen debut performance and birthdate. It was the first sound cartoon that was a major hit. Walt Disney provided the voice for Mickey until his death.